What Happens When Police Make a Warrantless Entry of a Home for Medical Emergency? Given Central Florida's temperate weather in November, an open door at 8:00 in the morning, without more, cannot justify a warrantless entry based on a feared medical emergency or the community caretaker function. What happens when police make a warrantless entry of a motor vehicle? Attorneys Note: Traffic cops use the community caretaker function to justify DUI arrests of drivers that are found sleeping in a parked car. In Florida, this is known as a DUI Actual Physical Control. You can see how a Florida Court addresses the seizure of a sleeping motorist. Sometimes the opening of a door of a sleeping driver is handled the same way the court handled this Treasure Island case where the charges are thrown out after a Fourth Amendment motion to suppress is granted. Opinion filed January 22, 2016. Appeal from the Circuit Court for Pinellas County; Chris Helinger, Judge. Pamela Jo Bondi, Attorney General, Tallahassee, and Wendy Buffington, Assistant Attorney General, Tampa, for Appellant. J. Andrew Crawford of J. Andrew Crawford, P.A., St. Petersburg, for Appellee. 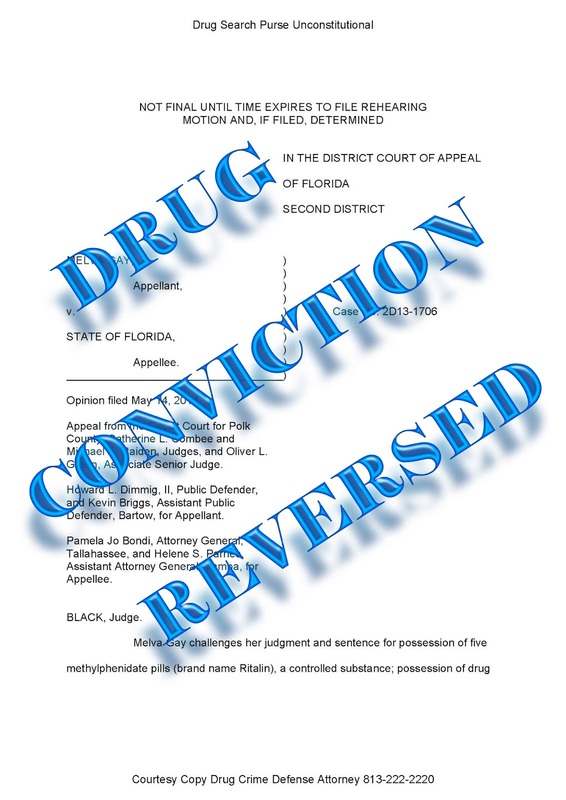 The State appeals the order granting John Fultz's motion to suppress evidence in his criminal prosecution for possession with intent to sell, manufacture, or deliver methamphetamine. In this case, we are called on to determine whether the exigent circumstances exception to the warrant requirement for a feared medical emergency or performance of a community caretaking function justified the warrantless entry and search of Fultz's home. Because the police had no objectively reasonable basis to believe that there was an emergency inside Fultz's residence to justify a warrantless search, we affirm. Officer Lovelace, a patrol officer for the Treasure Island Police Department, was in the area of Fultz's townhouse at around 7:45 a.m. on November 26, 2013, where she had just completed a "house check" on a nearby home.1 Officer Lovelace testified that she had been previously contacted by a citizen who had been keeping traffic logs for Fultz's townhouse due to "suspicious foot traffic." Two weeks prior to the search at issue, Officer Hansell, a St. Petersburg police officer who lived in the area, told Officer Lovelace that he suspected there was drug activity at the townhouse. Further raising her suspicions, when Officer Lovelace reported for her shift roll call that morning, Patrol Sergeant DeShay informed her of unconfirmed information he received from an informant regarding a possible meth lab in the garage of the townhouse. After conducting the requested house check, Officer Lovelace decided to drive by Fultz's townhouse, which she suspected contained a meth lab. As she was passing by, she noticed that the front door to the townhouse was open, a light was on upstairs, some mail was on the floor under the mail slot, the garage door was closed, and a car was parked in the driveway. Officer Lovelace testified that based on her suspicion of drug activity, she called for backup about a minute after observing the open door. 1Officer Lovelace testified that the residents of the home were out of town and had requested that Treasure Island police check in on their home, a service that Officer Lovelace routinely provides as a part of her patrol. Sergeant DeShay and Officer Smallen arrived on the scene ten minutes later. Before proceeding any further, DeShay contacted Detective Taylor in the Treasure Island police drug division and informed him of the situation, but Taylor declined to join them at the scene. Notwithstanding, based on the open door, mail, and unconfirmed reports of drug activity, the three officers decided to enter the home to conduct a "welfare check" on the residents. Sergeant DeShay testified that he knocked on the open door, announced "police," and then entered the residence. He immediately opened the door leading into the garage and discovered signs of an active meth lab. The trial court ultimately suppressed this evidence, and this appeal ensued. U.S. 398, 403 (2006)); see also Boyd, 615 So. 2d at 789 ("[T]o allow a warrantless entry into a person's home in an emergency situation, there must be objectively reasonable circumstances that convey to the police officer an articulable, reasonable belief that an emergency exists."). The exigent circumstances exception is not a shortcut by which police may circumvent the requirement of a search warrant. These exceptions are based on a police officer's ability to articulate objective facts which make the procuring of a warrant impractical. See Davis v. State, 834 So. 2d 322, 327 (Fla. 5th DCA 2003) ("The sine qua non of the exigent circumstances exception is 'a compelling need for official action and no time to secure a warrant.' " (quoting Michigan v. Tyler, 436 U.S. 499, 509 (1978))). "[I]f time to get a warrant exists, the enforcement agency must use that time to obtain the warrant." Herring v. State, 168 So. 3d 240, 244 (Fla. 1st DCA 2015), review dismissed, 173 So. 3d 966 (Fla. 2015) (alteration in original) (quoting Hornblower v. State, 351 So. 2d 716, 718 (Fla. 1977)). In this case, the State contends that the police were justified in entering Fultz's townhouse because they reasonably believed that the open door and scattered mail portended an emergency. Specifically, the State argues that two particular types of exigencies justified the police action in this case: the community caretaker exception and the feared medical emergency exception. The community caretaker exception arises from the duty of police officers to "ensure the safety and welfare of the citizenry at large." Ortiz v. State, 24 So. 3d 596, 600 (Fla. 5th DCA 2009) (quoting 3 Wayne R. LaFave, Search and Seizure: A Treatise on the Fourth Amendment § 5.4(c), at 201-02 (4th ed. 2004)). It is clear from our review of the record that the officers involved in this case were motivated by a desire to serve and protect the Treasure Island community. And this court has held that "the operation of a methamphetamine lab is inherently dangerous, presents an immediate threat to public safety, and is well within the scope of the exigent circumstance exception." Barth v. State, 955 So. 2d 1115, 1118 (Fla. 2d DCA 2006). However, police community caretaker functions are "totally divorced from the detection, investigation, or acquisition of evidence relating to the violation of a criminal statute." Cady v. Dombrowski, 413 U.S. 433, 441 (1973). And to justify entry under this exigency, the police must have a reasonable belief that a meth lab is being operated within a residence "based on their experience, facts developed during investigation, and observance of [the suspect's] activities." Barth, 955 So. 2d at 1118. In this case, the officers who entered Fultz's home did not have any special training related to meth labs, had not conducted any investigation into the reports of possible drug activity in the home, and had not made any observations of the residents or their activities that morning. Prior to the warrantless entry, police had not conducted any surveillance or controlled drug buys, made contact with Fultz, or initiated any other investigation into the potential criminal activity or habits of Fultz. Accordingly, we agree with the trial court's conclusion that the police did not have a reasonable belief that could justify a warrantless entry under the community caretaker exception to the warrant requirement. The feared medical emergency exception "permits police to enter and investigate private premises to preserve life . . . or render first aid, provided they do not enter with an accompanying intent either to arrest or search." Riggs v. State, 918 So. 2d 274, 280 (Fla. 2005) (alteration in original) (quoting Hornblower, 351 So. 2d at 718). This exigency recognizes that when there is a threat to safety and no time to secure a warrant, "the need to protect life and to prevent serious bodily injury provides justification for an otherwise invalid entry." Vanslyke, 936 So. 2d at 1222 (quoting Riggs, 918 So. 2d at 279)). However, the police must have an objectively reasonable fear that a medical emergency is occurring inside the residence. See Riggs, 918 So. 2d at 281. The officers testified that the open door and the mail in the foyer coupled with their suspicions of an active meth lab led them to believe that someone inside had overdosed or was otherwise in need of immediate medical attention. The cases relied on by the State are distinguishable from the facts of this case because in each the officers' belief that there was an immediate need for their entry into the residence to address a medical emergency was based on more than just an open door, mail, and unconfirmed and uninvestigated reports of drug activity. See, e.g., State v. Shillingford, 136 So. 3d 1242, 1244 (Fla. 5th DCA 2014) (holding that exigent circumstances existed when officers summoned to investigate a domestic battery "arrived and observed [a] blood trail leading to [the defendant's] apartment and heard moaning coming from within the apartment"); Davis, 834 So. 2d 322 (holding that warrantless entry was lawful when a neighbor, who called police about a possible burglary, reported an open front door and the resident's dog was wandering outside and police observed signs of forced entry). In this case, the officers were not summoned to the residence for concerns regarding the residence or its occupants, did not see any blood or evidence of possible criminal activity, did not hear anything within the residence that would lead the officers to reasonably conclude that someone in the residence was in distress, and observed no signs of forced entry. The officers conducted no investigation into the unconfirmed reports of a meth lab on the premises and witnessed nothing consistent with the presence of a meth lab. There was nothing that could have led the officers to form an objectively reasonable belief that there was an ongoing medical emergency in the residence that required their immediate assistance. We agree with the trial court that the Treasure Island Police Department's expressed policy of entering a home when they observe an open door and the residents fail to answer their hail is constitutionally troubling. There are many reasons that a citizen could leave a door to their home open; an open front door alone is not enough to support a reasonable belief that an exigency exists and cannot justify a warrantless entry into a residence. See, e.g., Kyer v. Commonwealth, 612 S.E.2d 213, 217 (Va. Ct. App. 2005) (holding that an open door on an August night absent some other reason for concern could not support a reasonable belief that would justify entry under the exigent circumstances doctrine); State v. Christenson, 45 P.3d 511, 513 (Or. Ct. App. 2002) ("[A]n open door on a summer morning is not, in and of itself, a circumstance that could give rise to a reasonable belief that entry is necessary to prevent harm to persons or property. It is simply too common an event to create a concern of harm in the absence of other signs of trouble."). Given Central Florida's temperate weather in November, an open door at 8:00 in the morning, without more, cannot justify a warrantless entry based on a feared medical emergency or the community caretaker function. As explained in Hornblower, the police may not "approach a dwelling, armed only with their own subjective suspicion that illegal activity was afoot, and wait for some . . . justification to break down the door and burst into the dwelling." 351 So. 2d at 718. Accordingly, we affirm the order granting the motion to suppress. WALLACE and KHOUZAM, JJ., Concur.